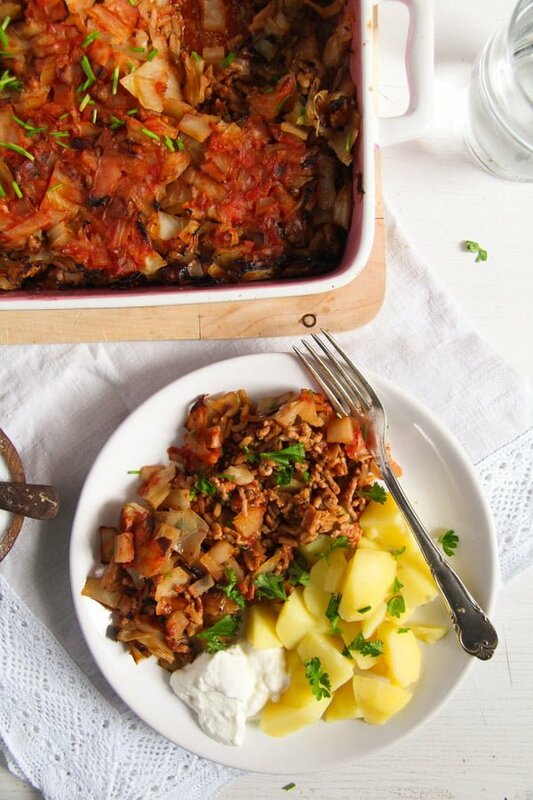 Comforting “stuffed” cabbage casserole, Romanian style. 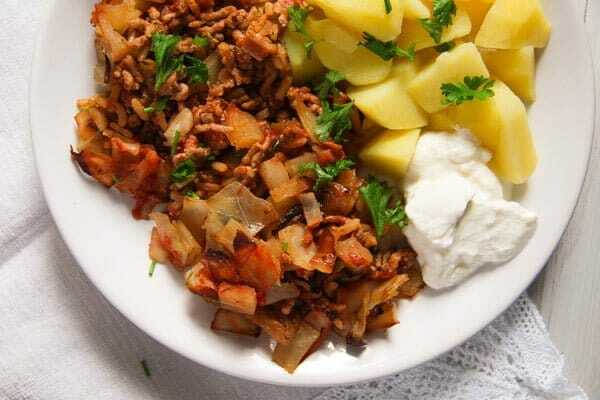 A deconstructed version of the stuffed cabbage rolls: layered shredded cabbage and ground pork. This is an updated post from December 2015. 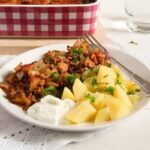 This dish, also known as Varza à la Cluj in Romania is the simplified version of those heavenly Sarmale, the stuffed cabbage rolls, which must be the best BEST dish in the Romanian kitchen. Every Romanian knows what I am talking about and I could almost bet that any person out there who knows somebody from Romania personally has at least heard about those cabbage rolls. We love them around here as well, they were my absolute favorite dish when growing up, my grandmother made the best in the world and I am trying to take this tradition further. My German husband loved them instantly, the first time he ate my grandmother’s Sarmale and my kids like them too. There is only one hitch with sarmale: it takes really long making and cooking them. I always make two huge pots, they taste even better after you have reheated them repeatedly and I spent ages rolling them and even longer cooking them. So they remain a treat, we only have them a few times a year. What I do cook more often than that is this simplified version of the sarmale. They taste very similar but the work involved is minimal in comparison and the cooking time is also much shorter. I use ground pork to make this dish, that makes it really authentic, in my opinion. You can definitely use only beef or a mixture of pork and beef, but somehow I feel that that would make it less Romanian. Beef was never big there, at least not in my family, pork always had the leading role when it came to eating meat. Chop the onion finely and the bacon into small cubes. Heat a heavy pan, add the bacon cubes and fry until some of the fat has rendered, about 2 minutes. Add the onion and continue cooking until the onions are golden. Add the ground meat and the dried herbs and cook, breaking the lumps, until nicely browned. In the meantime cook the rice in salted water until half cooked. Read the package's instructions and cook the rice for a bit more than half the recommended time. Mine was supposed to be cooked for 16 minutes according to the instructions, so I only cooked it for about 10 minutes, it was still a bit grainy in the middle. Drain the rice and give it to the browned meat. Add 1 tablespoon tomato puree and 2 tablespoons sour cream to the meat, the sweet and the hot paprika and some salt and pepper to taste. In the meantime chop the cabbage finely. Heat 2 tablespoons oil in a very large pot and cook the cabbage until golden, about 10 minutes, stirring quite often in between, so that it gets golden all over. Add one cup chicken broth and the bay leaves, cover and simmer for about 15 minutes. Adjust the taste with salt and pepper. Preheat the oven to 200 degrees Fahrenheit/ 400 degrees Fahrenheit. 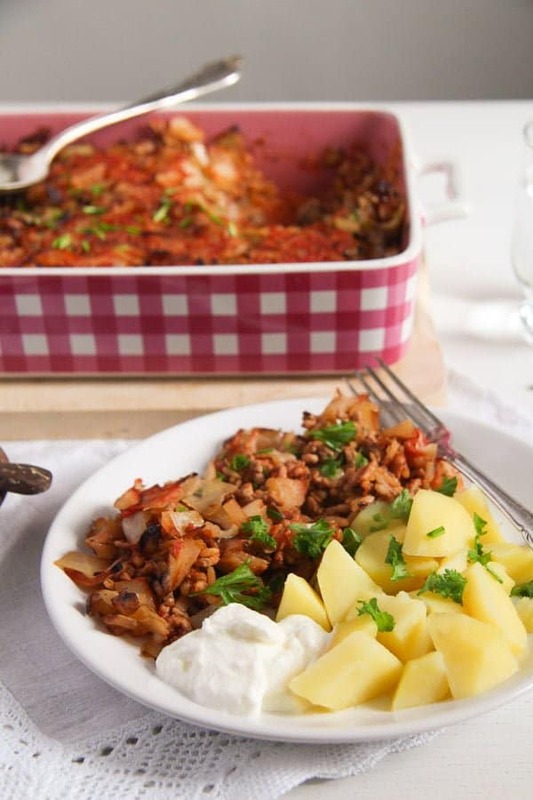 Pour 1/3 of the tomato puree and the rest of the sour cream into a large casserole dish. Spread all over. Layer ½ of the cabbage and about 1/3 of the remaining tomato puree. Spread the meat in an even layer over the cabbage, cover with the rest of the cabbage. Pour the rest of the tomato puree evenly over the cabbage. Bake for about 30-40 minutes until the rice is cooked and the casserole is nicely colored. 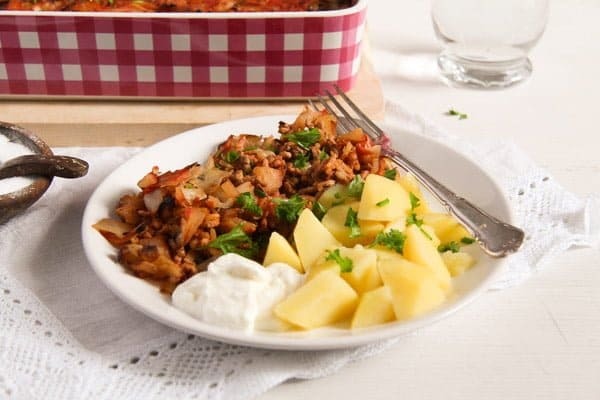 Serve with potatoes or bread and more sour cream (or yogurt for a lighter version). My husband LOVES stuffed cabbage rolls! An I am willing to bet he would devour this entire casserole! Love that you turned the rolls into something much easier to prepare! Fabulous, my dear! Cheers! 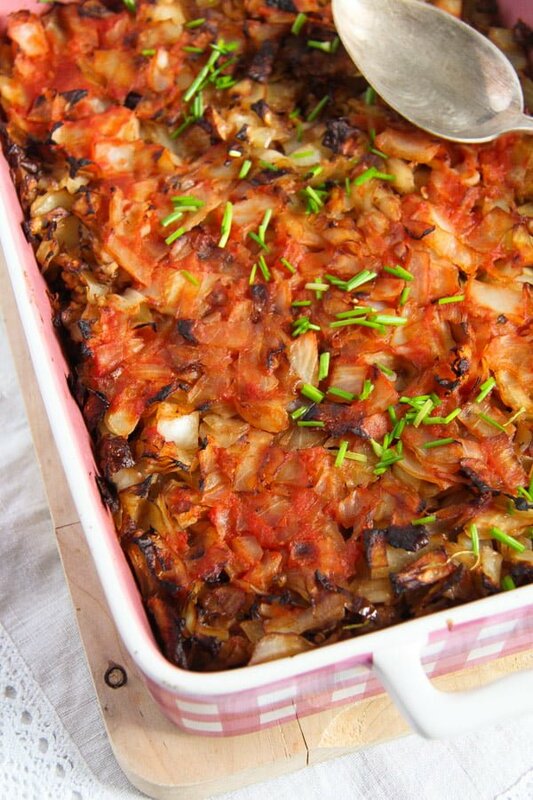 Stuffed cabbage in casserole form..it looks not only comforting, also very healthy and delicious, Adina. I think I could easily change my husband from a cabbage hater to a cabbage lover with this recipe. So I have a question – I’ve seen Hungarian and Spanish paprika and smoked paprika, but not hot paprika. Have never seen it. Where do you get it? I’m going to check to see if I can find it online. Thanks Adina!